My Son's First Visit To Times Square: This Dad's Dream Come True! 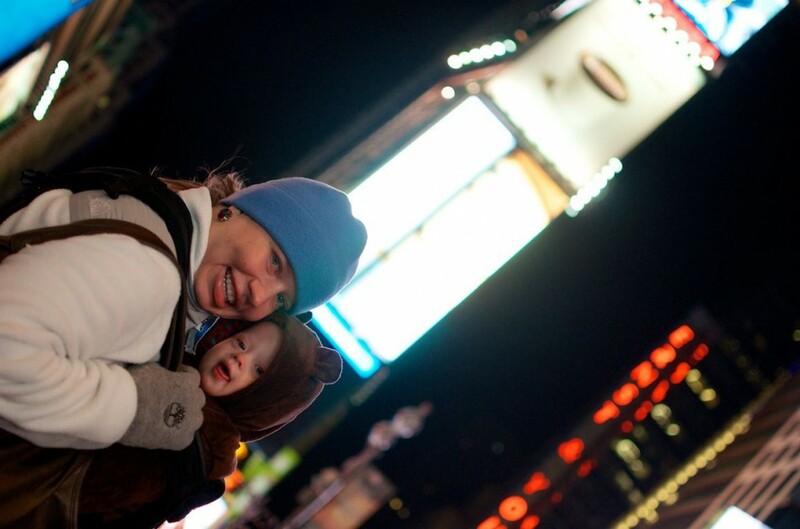 You are here: Home / Family / My Son's First Visit To Times Square: This Dad's Dream Come True! It’s been my dream to take Noah to New York one day, and we actually had a trip planned to visit even before our Target post went viral. However, it’s cool how things work out sometimes. As you’ll see in a few posts, we ended up becoming friends with Ryan (the child with Down syndrome that appeared in the Target ad) and his family and it turns out they actually live in the New York area. So we were excited to get to spend some time with them on our trip. I remember the last time I was in New York. My wife was sill pregnant with Noah, and I couldn’t stop imagining how awesome it was going to be when I got to bring my son to this incredible place for the first time. I think he’s the only person that actually reads these! 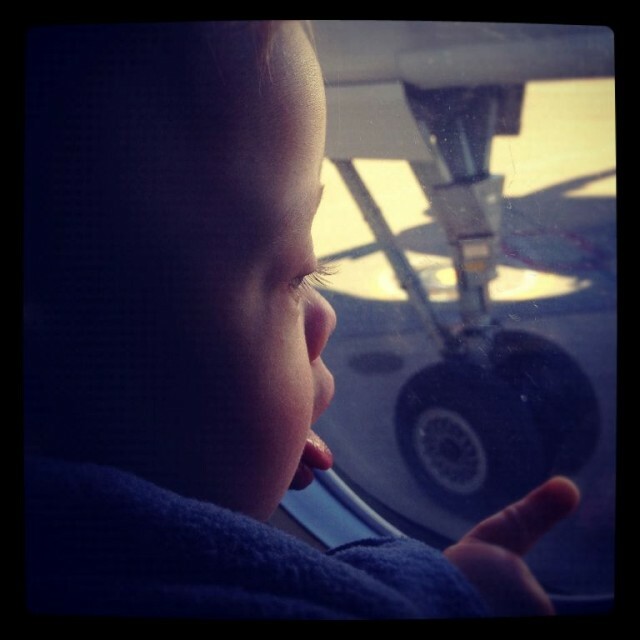 I thought about the plane ride, and how excited he’d be the entire time, and how he wouldn’t be able to wait to finally step off that plane and see New York for the first time…! As you can see, that dream really didn’t come true. Ha,ha! As you can tell he can’t wait! He did however like my iphone! I thought about his first taxi ride into the city, and how his wide eyes would be when he crossed over that bridge and saw the New York City skyline for the first time. (In my imagination he was tall enough to actually see over the seat…) However as you saw in the video he did enjoy a nice bottle of milk on his way into the city! One cute bear, and one large city! We got to our hotel a little late so we didn’t have a lot of time to do explore, but we wanted to eat, and I wanted to take Noah to Times Square for the first time. Being that it is winter in NYC it was pretty cold we bundled Noah up like a cuddly little bear (talk about an oxymoron) and headed down stairs. 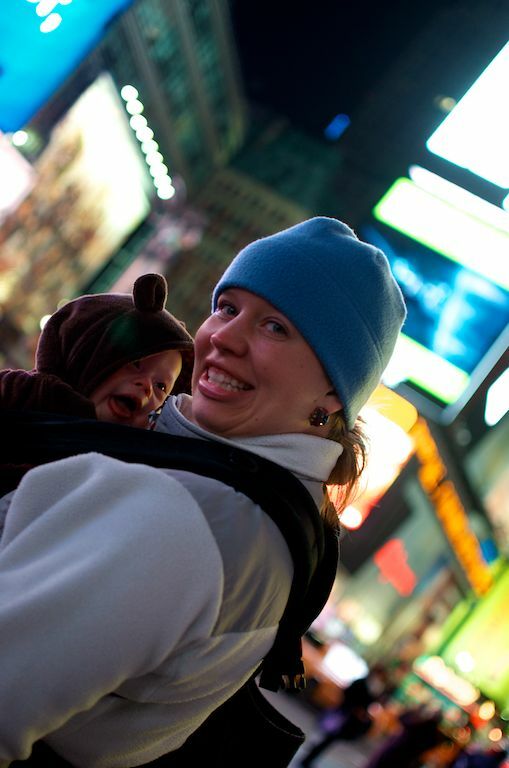 I wondered what it would be like when Noah saw the bright lights of Times Square for the first time. Well, I didn’t have to wonder any longer. It was awesome seeing his eyes fill with wonder and curiosity as took it all in. It really was a dream come true for me! There are no words to describe how much I love this lady and this little boy! Curiosity and wonder all wrapped up in one cute bear! 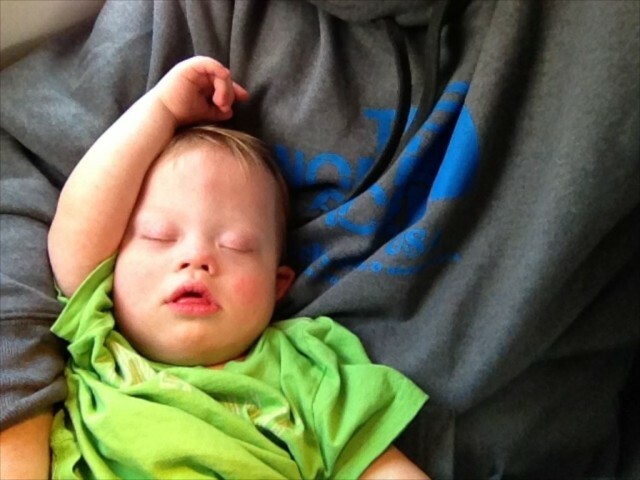 I know some children with Down syndrome don’t do well around a lot of bright and loud stimulation, and you may wondering how Noah handled Times Square. I have to say he really enjoyed it. In fact, he’s always been a fan of bright and shiny toys. The brighter, and louder, the better. As he grows up it’ll be interesting to see if this stays the same, and how he’ll react to large crowds. 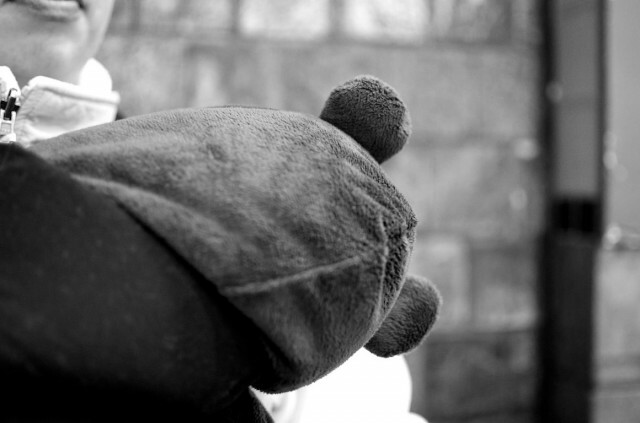 It’s to early to tell that now, although I have noticed that even though Noah is a very energetic little boy he has the tendency to get shy around people sometimes…but who doesn’t? After walking around for a little bit we took Noah into one of my favorite places in New York, The Times Square Toys R Us, although not as awesome as my favorite toy story in the city, we still had a blast! 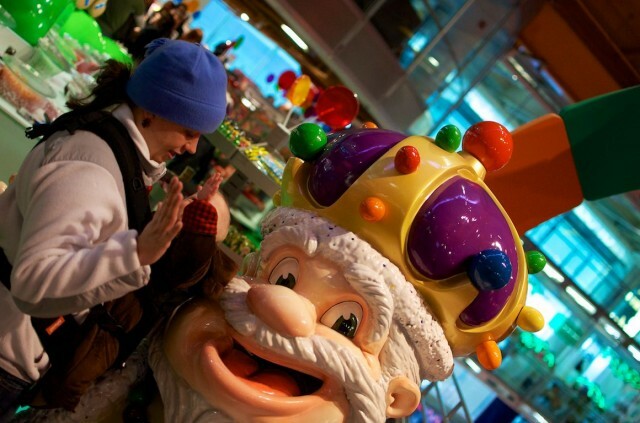 The King of Candy deserves a high five! And by the time we made it back to our hotel he was 100% out and ready for a fun filled weekend! It’s been a long day…..
We had a blast in New York and can’t wait to share the rest of our trip with you guys. Have you ever taken your child to Times Square (or another busy place) if so what did they think about it the first time they saw it? What is one of your favorite places to go visit, either by yourself, or with the family? How does your child like places with a lot of stimulation? Are the fans, are not so much? Take a minute to leave a comment and tell us about it. 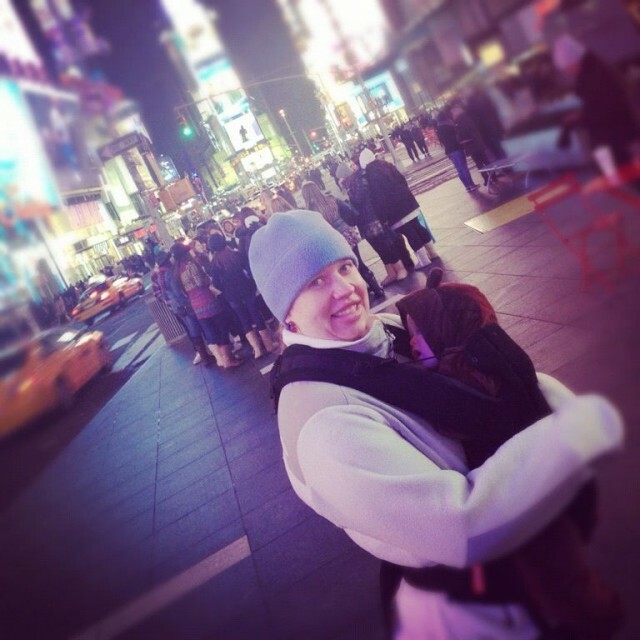 My theory is that Noah was comfortable with the bright lights and noise of Times Square because he was snuggled up to his mommy, which we know is always a safe place. Sometimes kids take their cues from their parents, so you love the lights and action, therefore Noah loves the lights and action. I also think, (okay I am almost done, but I do have an opinion on almost everything) that Noah is so, so secure in the love of his mama and daddy that he is not quite so fearful as he might be. And I am NOT suggesting that because your child is afraid of something, they are not secure in your love. Thanks for more pictures of your precious, precious little bear. I’m glad you enjoyed the pictures, and you may be right. Noah certainly enjoys being held and cuddled. We are very excited to take Ava to NYC as we are only a quick hour commuter train ride in. Gails sister (the Pedi Chiro) Hobokenchiro.com (had to give a plug is doing wonders for us). Glad you had a wonderful trip. Ava will only be 7 months around the time of the holidays, but want not start her early and get her ready for the crazy loud world we live in! I think it is great that you exposed Noah to that environment. Can’t wait to hear more about it! Maybe next time we will get to meet you there! didnt mean not! I will conquore the Iphone spell check eventually! If you do be sure to share some pictures with us! 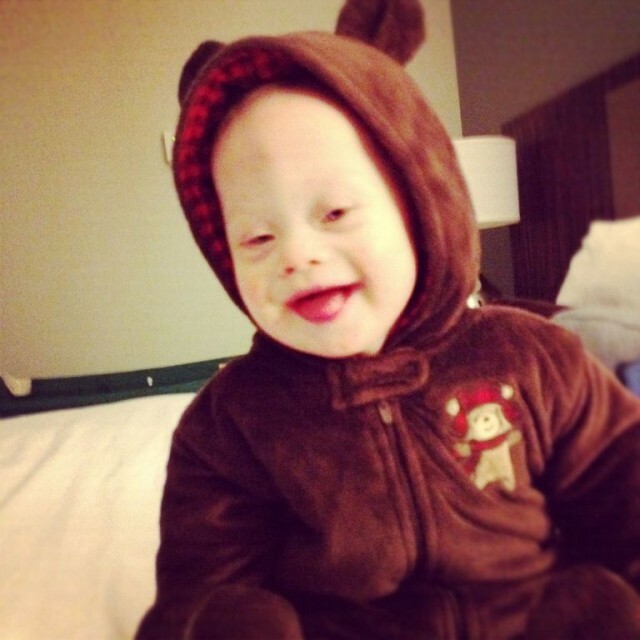 By the way, Noah’s picture was selected to appear in the 2012 NDSS Buddy Walk Times Square video, so there is a chance we may come up for that at the end of Sept. We’ll have to let you know if it works out, and maybe we can make a meet up happen! Sounds great! We are doing our first Buddy Walk in Madison, CT in the fall. Excited to get to meet some new and experience parents of children born with DS. 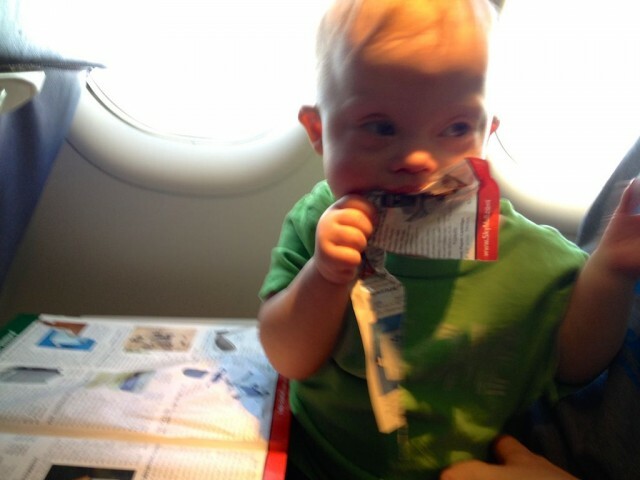 Noah seemed to enjoy the trip. 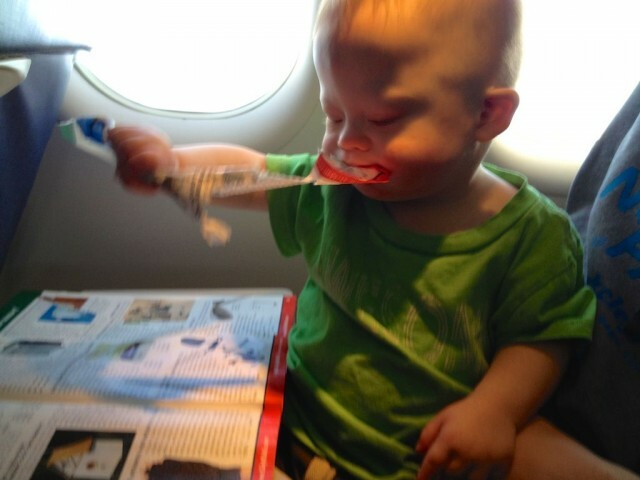 Definitely loved muching on the skymall. I haven’t been to NYC in a very long time so I am so jealous Noah. Glad you have a great trip! 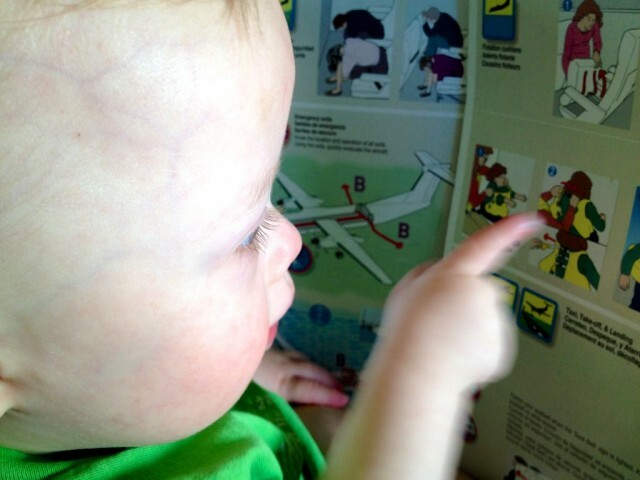 Oh, and I’m pretty sure Noah’s gone more places in his short 19 months, than I went my entire first 18 years of life! ha,ha! Levi has just started taking a bit ti warm to strangers. He also has started to not like loud noises in the car. 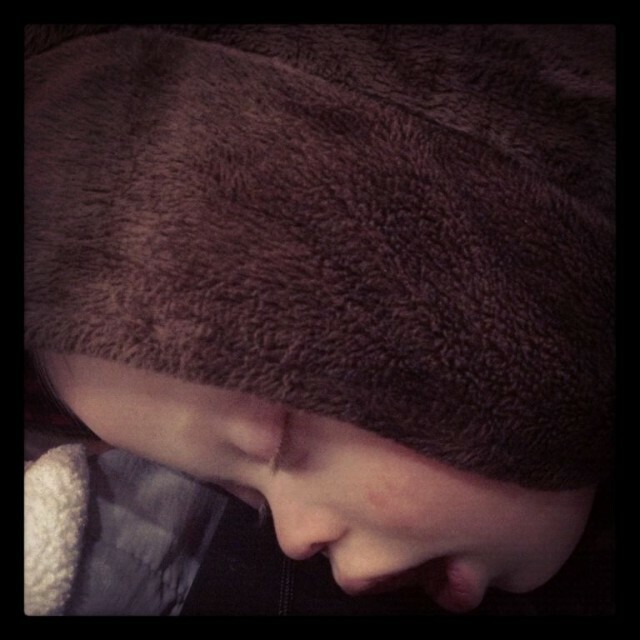 I was thinking it was because he has to get tubes in his ears next week due to fluid that wont go away. 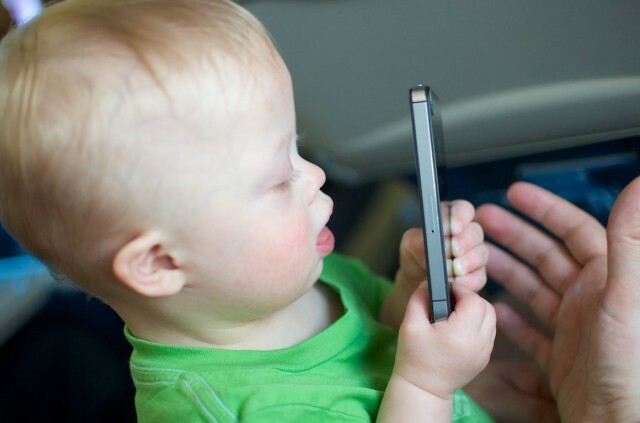 So for now I have been really working on getting my older kids to speck low in the car. Omg!!! I never realized how excited can be a dad about New York City until now lol… We live in Argentina but my husband is from New York and he cant wait to show Vincent where he grew up and of course the rest of the family and friends, today Vin is 1 year old, we are going to go in February so Vin is gonna be 17 months old. Is very hard for me to understand my husband, im more worry about the ten hours trip from Buenos Aires to New York than our visit to the big apple. I hope Vin doesnt feel weird being away from home, he loves going out but i can tell when he gets tired of being out. Your post was awesome!!! Thanks a lot for sharing your experience in New York, now i think i understand him better. Looks like Noah really enjoyed, Vin loves too the lights and noise, i think he will like it too. 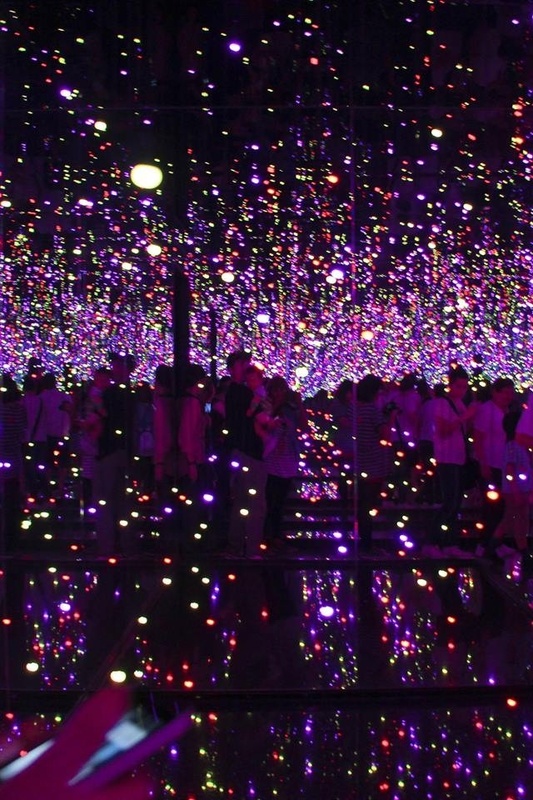 We went to MALBA, a museum here in Buenos Aires, they had an exhibition of pop art, the artist is Yayoi Kusama, Vincent loved it!!!! She is from Japan very famous artist. I didnt see a lot of babies at the museum but omg!!! It was definetly amazing for babies!!! Here is a picture!! !